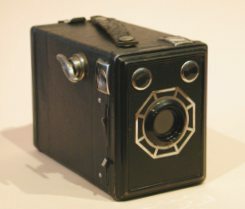 Box cameras were unexpensive and designed for the general public. Though of small collection value, box cameras played a very important role by making photography accessible to the general public. They meet the requirements of today's disposable cameras : to allow anyone to take pictures at the lowest price and in the most simple way. For this purpose, and like disposable cameras, boxes were of very simple design : a one element fix-focus lens and only one aperture (sometimes two or three with a very simple diaphragm) and one shutter speed. They were the first "point and shoot" cameras. The model presented here was made by the French camera maker GAP from 1948 to 1949. It has two finders : one for horizontal and one for vertical shots. The shutter offers instantaneaous and B pose.